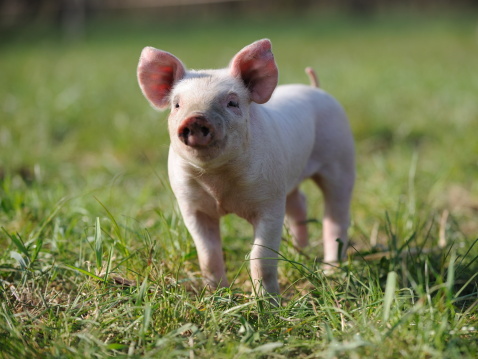 A shoat is a newly weaned pig that typically weighs in at about thirty pounds. It wasn’t unusual to find a farmer thinning a litter of pigs (also known as a drift of pigs) at this time of year, for different reasons. Many farmers bought shoats at this time of year to fatten up over the summer and slaughter in the fall. For reasons known only to himself, Old Oliver chose to slaughter four of his young pigs rather than sell them. Perhaps the shoats in question were unpromising specimens, or perhaps the Ames family was ready for a little fresh pork. In the first part of the 19th century, the word “shoat” was also used as a pejorative slang term, intended to describe someone as fairly useless. To call someone a shoat was to say that he or she was dispensable and unimportant. Thurs April 29 Baked twice in the brick oven. The aroma of baking filled the Ames house today as Evelina produced pies, cakes, bread and more. Or should we say that the smell, or the scent, or the fragrance, or the odor of baking bread was apparent to anyone who stepped into the house? Roget’s Thesaurus would offer us any one of those synonyms for the word aroma. The first edition of Roget’s Thesaurus was published on this date in 1852. 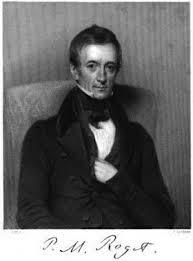 Peter Mark Roget, a British physician, inventor and theologian, began to compile synonyms as a young man as one way of combatting the depression that plagued him for much of his life. Beginning the work in 1805, not long after he had completed his medical studies, he spent nearly fifty years bringing the publication to fruition. The first edition had approximately 15,000 words; it has been continually expanded, updated regularly ever since. The Kinsleys of Canton came to visit in the afternoon and, no doubt, they could smell the fresh baked bread. Lyman Kinsley was an iron trader who had many dealings with the Ames family; within the decade, his business would be owned by the Ameses and overseen by Frank Morton Ames. That was in the future, however. On this day, he, his wife, Louisa, daughter Lucy and younger sons, perhaps, all came for “quite a long call.” Evelina enjoyed their company, but after they left she bounced right out of the house to go into the village to visit relatives and bring home rose slips. The garden! It was the middle of a work week, but the Unitarian ministry was busy. In Bridgewater, (or West Bridgewater) a Mr. Ballou was ordained as minister. 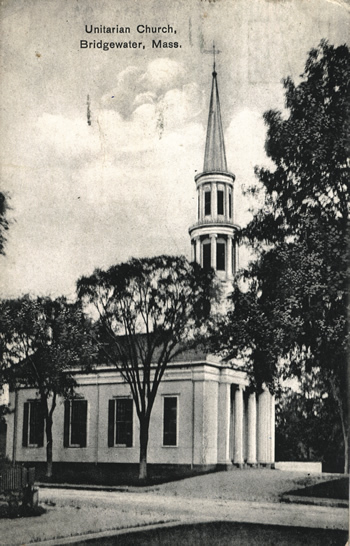 The name Ballou was associated with many late 18th and 19th century men of the cloth, particularly with Hosea Ballou, an early leader of the Universalist Church. Today’s Mr. Ballou wasn’t he, but may have been a relative. Why were the Ameses invited to this ordination? Why did they attend? What was the connection? Were they related to the Ballous? They were distantly related to various Ameses in the area, including Thomas Ames, a 52 years-old farmer, who kindly had them to dine. see her and carried Augusta some plants. Evelina shuttled around the house and grounds today, keeping track of indoor painting and outdoor gardening and, most likely, everything in between. A gardener arrived on assignment from the shovel factory to plant some honeysuckle bushes that Evelina had acquired from two obliging neighbors, the Swains and the Lakes. The gardener also help her move some currant bushes back from Queset River, the little brook behind the Ames property. The Queset, which historian William Chaffin found to be “a pleasant-sounding name,”* is only the most recent name for the stream that runs from north to south through Easton. 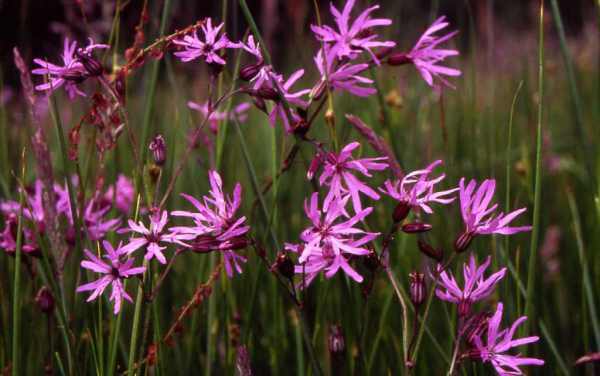 It was first identified by that name around 1825. 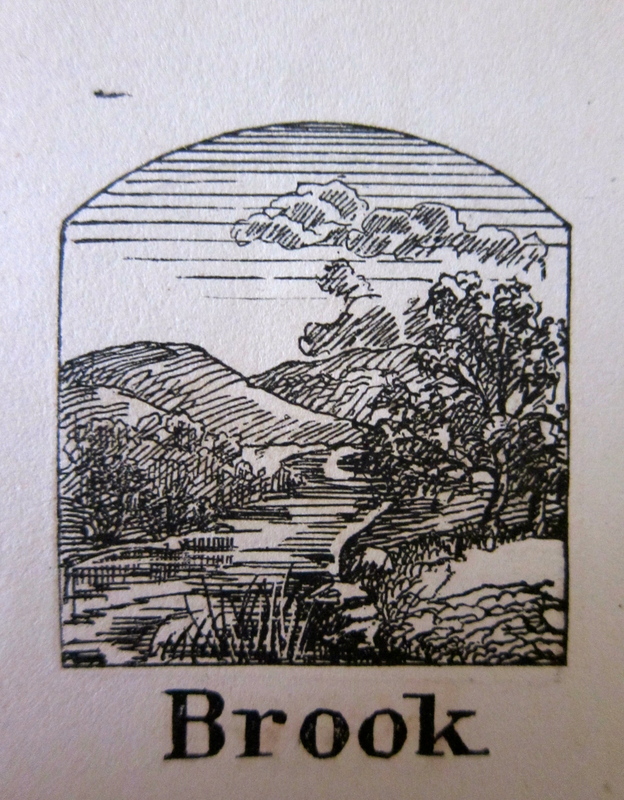 In earlier days it was known as the Mill River, and, before then, the portion particular to North Easton was called Trout Hole Brook. One would have to go back to the early 18th century, before water privileges had been claimed and dams built, to find trout in the stream. The waterways of Easton have frequently changed over the years, as needs have altered and other sources of power been identified. In 1852, water power was still essential to the shovel shops, and many dams – including the one that had almost breeched the dam during the heavy rainstorm of the previous week – were depended upon to produce the water flow needed to keep the factory going – and the currant bushes growing. * William L. Chaffin, History of Easton, Massachusetts, 1886, pp. 10 – 11. **Douglas Watts, at losteaston.blogspot.com, is a conservation writer who would like to turn the Queset back into an active trout stream. 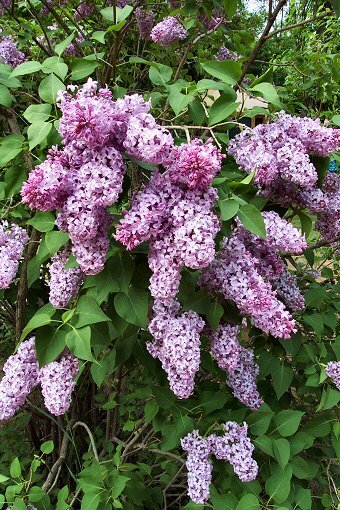 Edwin Manley, Easton’s resident green thumb, brought Evelina her lilac bush this morning, along with a quince tree, some comfrey, ragged robin, cowslip and “fleur de luce,” which probably was Evelina’s spelling for fleur-de-lis, also known as iris. For less than a dollar, she acquired flora that promised to add fragrance and color to her garden. Later in the day she got more plants – for free, most likely – from her brother Alson Gilmore. The countryside itself was still wanting in color at this mid-spring juncture, something Evelina and her fellow passengers might have noticed on their way to and from the Gilmore farm. Henry David Thoreau wrote about the pale fields and expectant woods in his journal on this date: “The landscape wears a subdued tone, quite soothing to the feelings; no glaring colors.”* Perhaps Evelina’s rush to add more vibrant colors to her yard would have jarred his sensibility. The two diarists reacted differently to the awakening pulse of spring. Today after church, the sermons and small social obligations dispensed with, Evelina thought about her flower beds. The day was “fair” and “some warmer,”* so with niece Sarah Emily Witherell and daughter Susan Eveline Ames, she rode up to visit her go-to gardener “to speak for some plants.” Mr. Manley indicated he would bring the plants by the next day. Evelina wouldn’t have been able to plant anything today, it being the Sabbath, but she could imagine where she would put the plants, and how they would look, the anticipation of which added to her delight. 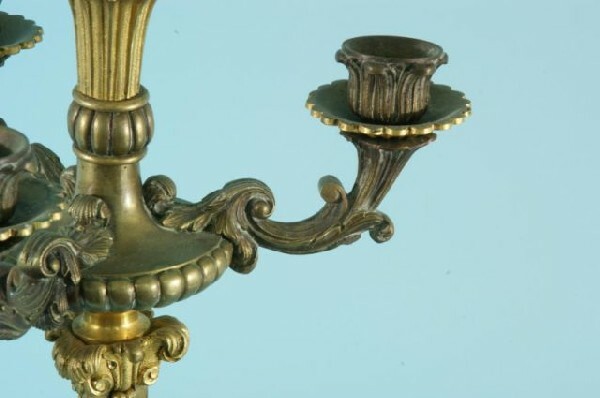 The bronze candleabras that Evelina bought in Boston today were purchased, in all likelihood, for the parlor. They were a formal throwback to the time when candles were used for lighting, which was the period that began when the Pilgrims first arrived and lasted to the early part of the 19th century. By 1852, however, oil lamps and very soon, kerosene lamps, were becoming standard fare for lighting. They were more economical than candles. Burning candles, then, was something of a “retro” effort that honored the grace and warmth of the familiar candlestick, and suggested that the homeowner had enough money to burn candles if he so chose. No smudgy little whale oil lamp for the parlor or the dinner table, though oil lamps of varying styles and efficiency might operate in the rest of the house. In the room in which company was entertained, the candleabras would glow, and brag. Both sisters-in-law came over at the end of the day to see what Evelina had bought, and it’s hard to imagine they were interested in the “gentlemans hose &c.” They came over to check out the new candleabras.